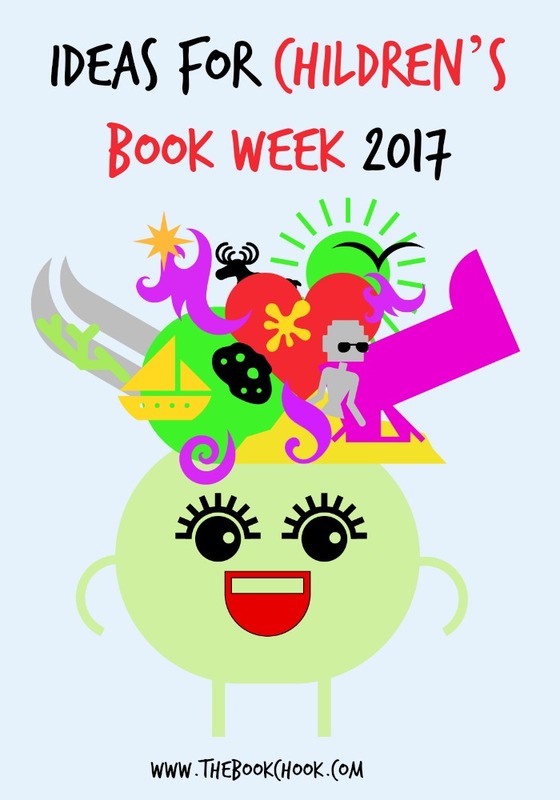 This year, Children’s Book Week in Australia is Sunday August 20 to Saturday August 26, 2017. 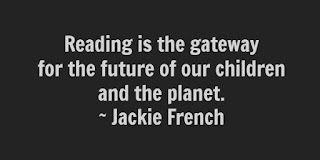 Here are some ideas and **free PDF resources to help parents, teachers and librarians explore that theme with kids. 1. 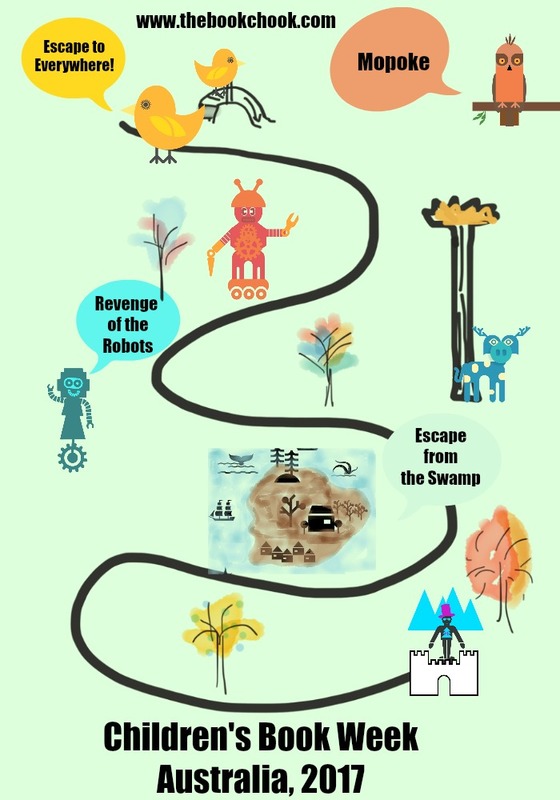 The Children’s Book Week theme in Australia is Escape to Everywhere. It makes me think of a time, perhaps after I’ve been working hard or doing something boring, when I get the chance to escape into a book. I usually find a comfortable place, open my book, and I’m instantly in a different world. I have adventures, escape from baddies, save people’s lives, laugh aloud, blink away tears and completely forget about what I was doing earlier. Through books, I can escape to all sorts of places. I’ve been to Hogwarts, Outer Suburbia, The Land of Take What You Want, jungles, the bottom of the sea and outer space. When I’m reading, it feels like I actually AM some place else - I can hear the mournful hoot of an owl, smell gunpowder or feel the thunder of hooves approaching. I can escape to real worlds too, and learn about everything from creating code to decorating cupcakes. What does Escape to Everywhere mean to you? 2. Most people escape from somewhere. Why would you want to escape to everywhere? What is good about visiting different places, both real and imaginary? 3. If “read” is the answer, what might the question be? 4. 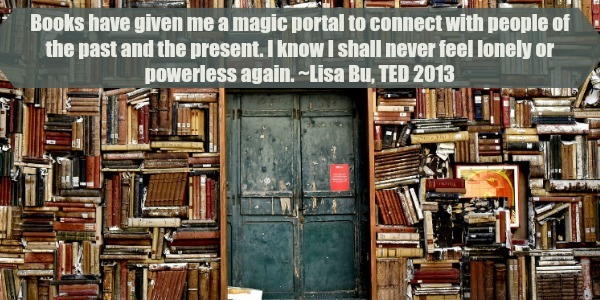 Do you have a special place where you like to escape and read? 1. Share the book The Fantastic Flying Books of Mr Morris Lessmore. 2. Now have kids watch the short film, The Fantastic Flying Books of Mr Morris Lessmore. 3. If possible, make available to kids the app, The Fantastic Flying Books of Mr Morris Lessmore, available on iTunes. * Which format did you prefer? Why? What were the similarities and differences between them? What were the strengths and weaknesses of each? Was there any one image, sentence or segment that stood out? * Morris became “lost” in a book. Has that ever happened to you? Was it a good thing or a bad thing? List the possible disadvantages and advantages of being lost in a book. * All your school library’s books have developed the ability to fly. One escapes through an open window and you must get it back or face the Wrath of the terrifying Mrs Liberry. You decide to get it back. What happens next? Make a storyboard about this adventure from your point of view. Create a series of images, text excerpts and sound files you can use to make a short video about it. * You’ve been given a chance to escape to a deserted island. What is the name of your island, and where in the world is it? * If you can only take three books to this island, which books would they be? Why? * It would be good to have a companion for your stay on the deserted island. What qualities would you want in this person? Design some interview questions to ask so you can work out who to take. * You find out you really can take any one person, currently living or not, with you in your escape to the deserted island. So who will it be? What is it about this person that made you choose them as your companion. Use an app like 30 Hands or some other way to record yourself explaining your choice. 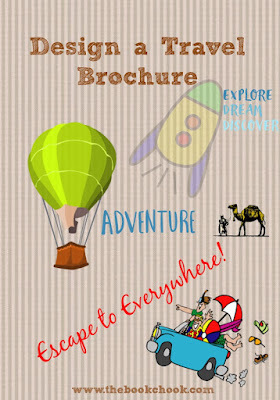 **I am sharing a free PDF travel brochure for kids, related to the activity (above) at my website. OR kids could design a travel brochure of their own, one that encourages people to read books! Your school principal has heard about the Children’s Book Week theme being Escape to Everywhere, and IS NOT HAPPY. The principal thinks this means all the students will escape from school, and is worried about getting into trouble from the Education Authority. He/she has decided to lock up the library and allow kids no access to books. NO BOOKS! Can you believe it? You and your friends work out a plan to set the books free again, and record your plan. The plan you decide to go with is to kidnap all the teachers in retaliation for your principal locking up the books. Quickly putting on disguises, you trick the teachers and lock them in the staffroom. This means your principal will have to teach all the kids alone!!!! Draw before and after shots of yourself or your classmates in disguise. Write out a plan in point form that might be used to get all the teachers into the staffroom, and keep them there until you let them out. Write a ransom note, explaining to the principal that you will let the teachers go free once the library is unlocked. Use these ideas and add your own to create a narrative. OR Create some kind of media artwork as a response to this scenario, choosing sound, images and text carefully to convey the message you want to your intended audience. **I am sharing a free PDF booklet for kids, called Setting Free the Books, about this scenario (above) at my website. Goal: to create an “escape room” for another group of kids. This might be for another class during Children’s Book Week, or for groups of kids during a school fete or other special day. Discuss ways of creating something kids must negotiate or solve to “escape” from the room. Remind kids how vital it is that children are not to be frightened or hurt in any way. Ideas might include creating a maze or tunnels from cardboard boxes kids need to crawl through, or needing to solve riddles or other puzzles to get past a gatekeeper. Or a combination of both! Kids could start by making a collaborative list of all the puzzles or riddles they know. They could research more, using books, computers and asking people they know. This will give them lots of ideas to choose from. If they’re stuck, you can help out by using ideas from here. And here. Some people like to have a theme or storyline for an escape room or puzzle-fest; others are happy to mix riddles with visual puzzles, number puzzles with rhyming puzzles, and have no story at all. But since Children’s Book Week is all about story, it might be great to choose a fictional world to set your puzzle(s) in. Decorating this world helps kids think about setting, and they can use what they know about story to set the stage for participants. There are excellent ideas to help create an escape or mystery game here. Many escape rooms have clues deliberately left as misdirection. In other words, they seem like clues, but lead nowhere. While some escape rooms for adults involve locked rooms and no directions at all, discuss with kids why this wouldn’t be a good idea. A locked box that is eventually able to be unlocked is safer, but still has an element of mystery. You could create a locked box model to share with kids something along these lines. There is also a commercial kit sold by Breakout EDU that schools can buy. Here is a video of a school participating. * Use these free printable letters to spell out Escape to Everywhere or Book Week or your choice. You’ll find A-Z in large, decorate-able letters or scroll down to find A-Z of letters filled with intricate designs perfect for colouring in. * Use the poem I Opened a Book by Julia Donaldson as a focus for student art works. 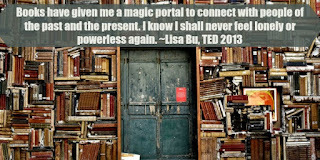 **I am sharing a free PDF poster advertising Book Week at my website. 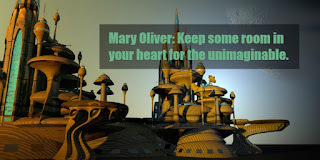 Here are some great quotes I believe are in keeping with the spirit of Escape to Everywhere. They make good discussion starters to use with kids. Mary Oliver: Keep some room in your heart for the unimaginable. Stephen King: Books are a uniquely portable magic. Mason Cooley: Reading gives us someplace to go when we have to stay where we are. 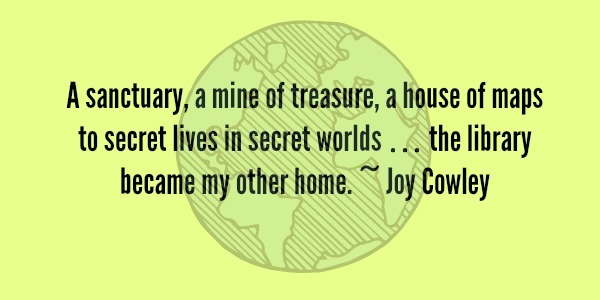 Joy Cowley: A sanctuary, a mine of treasure, a house of maps to secret lives in secret worlds… the librarybecame my other home. Mary Schmich: Reading is a discount ticket to everywhere. 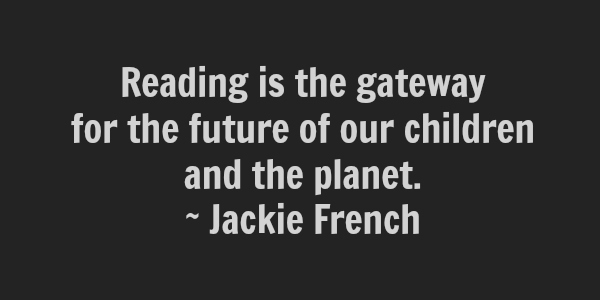 Jackie French: Reading is the gateway for the future of our children and the planet. 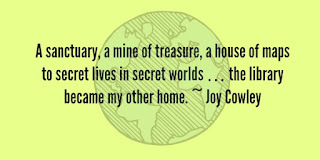 Joy Cowley: As often as you open a book, you come to new places and live new lives. Ipswich District Teacher Librarian Network's Book Week resources (free) and publication. Are you looking for a performance to help you celebrate Children’s Book Week at school? Check out Super Duper and Narelle Adams Edutainer. Go to Creative Net Speakers' Agency to book an author/illustrator visit and make your Book Week extra special. I’ve been making a list of books I think would be great for using with kids to explore the Children’s Book Week theme, Escape to Everywhere. These are books I’ve reviewed or learned about. Often these are books which have a character using imagination and travelling. Some emphasise a journey or a particular destination. Others have a quite literal “escape” scene teachers could share with kids as a model to their own writing. Some are on the CBCA Notables list for 2017. All are quite simply books with immense child appeal. And let’s face it, any book with child-appeal is a great one to share - the more books, the greater chance kids will find lots they like! The list is embedded below. 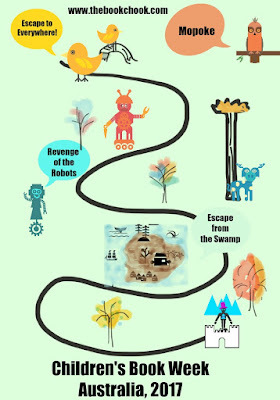 I’ll back on Wednesday 26/4 with lots of Activities for Kids in Children’s Book Week 2017 - Escape to Everywhere! Thanks Susan for being so generous with your wonderful ideas. I always check out Book Chook when I start planning for Book Week. Great to know, Yolande! Thanks for the feedback. can anyone help me with an easy costume that suits this theme need it for Friday. I think almost anything goes with this theme - I would ask your child where they have ever escaped to via a book. Failing that, think about escaping to the future or the past and look around at what you have at home that could be adapted. Can you create some kind of astronaut outfit with a belt and helmet? How about a historical figure or fiction character your child learn about via a book? A knight? An explorer? A magician?